When I first saw the IOCELL Contents Phone, I thought I was looking at something designed by Bang and Olufsen. I mean it has that cool grey color, plus a very blue look on the numbers. It also has a very artistic aesthetic, putting the receiver on the bottom of the phone and not the top that is interesting, to say the least. Not only that, it is a very practical device. 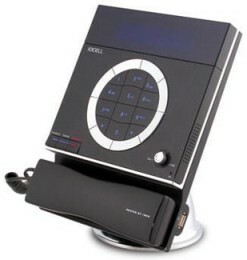 The IOCELL contents phone has a hard disk drive that allows the user to record conversations. The user can then download those audio files to his or her computer, and play them on an MP3 player or the Internet. We can only hope that there is no privileged information being shared. Other features of the IOCELL are voice guidance, and there is apparently a way to put music files on the phone, as well as a way to put music on hold. You can also put in background music, but we don’t have too many details on that. Of course, there are other features that you would find on other phones, such as a speakerphone, or an immediate call-in emergency. The IOCELL content phone is available at the IOCELL website, but I have not seen a price. In fact, the site is translated from the Korean, so I’m not certain if this IOCELL content phone is available everywhere.